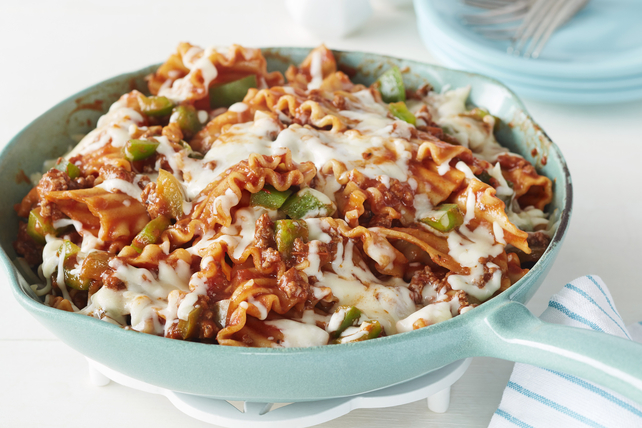 This all-in-one dish has all the flavour of baked lasagna but takes a fraction of the time to make! You can't go wrong with this Weeknight Lasagna Toss recipe. Add peppers, garlic, pasta sauce, water and dressing; mix well. Bring to boil. Stir in noodles; cover. Simmer on medium-low heat 10 to 15 min. or until noodles are tender, stirring occasionally. Remove from heat. Sprinkle with cheese; cover. Let stand 5 min. or until cheese is melted. Stir 1/2 cup ricotta cheese into noodle mixture before sprinkling with cheese. Traditional lasagna can take up to 2 hours to prepare. Our version only takes 40 minutes. You save almost 1-1/2 hours!